Maintaining a non-cooperative equilibrium is a challenging exercise. Not only will every individual partly have to constantly monitor what everyone else is doing, but in addition, there is a constant risk of escalation into protectionist policies. Trade disputes are already on the rise. The number of WTO dispute cases in 2012 was the highest in 10 years. Particularly successful at luring Russians, Cyprus has built up a large infrastructure of lawyers, accountants and other professionals schooled in the arts of tax avoidance. Its corporate registry now has 320,000 registered companies, a staggering number for a country with only 860,000 people. The euro’s core founding principles, based on the Maastricht Treaty’s “irrevocable” fixing of currency rates, and of the free movement of capital, have been violated. The euro will never be the same again; its preservation now depends urgently upon economic recovery. Without the delivery of economic growth, unemployment will rise to yet higher post-war record levels, and the widespread and growing disillusionment felt by EU citizens towards their economic regime will threaten to spill over into more explicit questioning of the euro’s suitability. Just a matter of time now for the euro? Will Cyprus turn out to be Creditanstalt redux? There is no other alternative but to free Cyprus from the bonds of the troika and the memorandum, House of Representatives President Yiannakis Omirou has said. Omirou also expressed his conviction that no Attorney General would dream of not following through with the results of an investigation led by an independent committee to apportion blame on those responsible for bringing the country’s economy and banking sector near collapse. The Hedgies don't seem to get that a reserve currency is a currency that exporting nations choose to save in. Oz has made a decision to save in RMB instead of USD in exporting to China. Is that taking on exchange rate risk, or is RMB as safe a store of value as the USD now? One could argue that as long as the RMB is pegged to the USD, it doesn't matter too much and if it increases exports, no big deal. Public frustration has been mounting over the lack of high-profile criminal prosecutions in the wake of the financial crisis here in the U.S. But the same cannot be said abroad. Several news outlets reported that Iceland's special prosecutor, hired in 2009 to investigate suspicious activities at several major banks, indicted fifteen bankers — including two chief executives — earlier this month over illegal activity tied to the meltdown of the country's banking system in the fall of 2008. The bankers are accused of stock-price manipulation and securities fraud. Apparently Obama’s idea of a Holy Week sacrifice is to feed American citizens to rapacious bankers, this time through the device of “public/private partnerships” to support infrastructure spending. Some NC readers were correctly alarmed by a speech by Obama on Friday on using public/private partnerships to fund infrastructure spending. This is not a new idea; Obama first unveiled it in his Statue of the Union address. But it is a singularly bad idea, that is, if you are anyone other than a promoter of or investor in these deals. As we’ve discussed at length earlier, these schemes are simply exercises in extraction. Investors in mature infrastructure deals expect 15% to 20% returns on their investment. And that also includes the payment of all the (considerable) fees and costs of putting these transactions together. The result is tantamount to selling the family china and then renting it back in order to eat. There is no way that adding unnecessary middlemen with high return expectations improves the results to the public. In fact, the evidence is overwhelmingly the reverse: investors jack up usage fees and skimp on maintenance. And their deals are full of sneaky features to guarantee their returns. Piling on more rent instead of government funding "in order to advance democracy and the free market." Neoliberalism aka crony capitalism at work. Rent-seeking is becoming the new "big issue." Left and right anti-establishment activists agree on the problem, but disagree over solutions. Mike Konczal is on it. However, I would put it as "progressives" rather than "liberals." The traditional liberal wing of the Democratic party is allied with the establishment, while the progressive wing is focused on reform. I would also say "Libertarians" rather than "conservatives." It's the Tea Party Libertarians who are agitating for reform in the GOP and traditional conservatives who are allied with the establishment. This looks like an Progressives and Libertarians agreeing that rentierism is a problem, and that government is a major factor in the generating artificial monopoly power. However, Progressives see this as a corrupt crony alliance between government and business, whereas Libertarians lay it all to the intervention of government in the private sector. Hence, the approaches to resolving the issues are entirely different. I suspect that a lot of the debate over policy in future elections is going to be over these approaches, although the progressive wing in the Democratic Party and the Libertarian wing in the GOP are still in the minority in their caucuses. However, I expect to see them gaining ground since these idea have youth-appeal. Without a proper modelling of state DGSE is simply mathematically flawed, and to dismiss mathematically correct approaches as ‘physics envy’ displays a basic error of understanding what is necessary to correctly model ANY dynamic system using the fundamental principles of applied mathematics. Noah needs to get some Maths Envy. If we correctly model state then we need correct modelling of all factor incomes and investments in future income streams that will yield factor incomes. Only then will the model be both microeconomically and macroeconomically consistent. But you have to do both together, at the same time, and only then will you be able to avoid the lucas critique. The approach that macroeconomics must be microfounded is the wrong way to approach this, it makes the most basic error in all of the social sciences, trying to collapse structure into agency. Hayek's argument is really at the basis of market fundamentalism, so understanding its shortcomings is important. On the other hand, I would agree with Hayek's analysis wrt to a central bank setting interest rates to manage inflation or to balance employment and price stability, for instance. There seems to be ample empirical evidence to warrant concluding that central banks have failed in this regard at great cost to the economies under their influence. Monetarism doesn't work. And it appears that it fails in being too loosely targeted. For example, monetary policy, which sets the cost of capital, often distorts asset prices since it looks chiefly at goods prices and in particular at the price of labor with a view to targeting inflation. In this it disregards asset appreciation and the wealth effect it communicates that is based on "fictitious capital," that is, unrealized, "paper gains, supported by credit. And, as Lord Keynes observes, Hayek's position reflects more the neoclassical equilibrium view than the Austrian view of economic calculation. This is an important article. It's a bit longish, so I've pulled out the essence. But I suggest you read the whole thing. This is about the transition to the Information Age and knowledge society from the Industrial Age and factory society, which in turn replaced the Agricultural Age and farm society. What's left for workers who are not knowledge workers in the Information Age is service work that cannot be profitably automated, computerized, or robotized. One thing all our machines have accomplished, and especially the internet, is the ability to reproduce and distribute good work in record time. Barring market distortions like monopolies, the best software, media, business processes and, increasingly, hardware, can be copied and sold seemingly everywhere at once. This benefits “superstars”—the most skilled engineers or content creators. And it benefits the consumer, who can expect a higher average quality of goods. The result is that, with the aid of machines, productivity increases—the overall economic pie gets bigger—but that’s small consolation if all but a few workers are getting a smaller slice. “Certainly the labor market has never been better for very highly-educated workers in the United States, and when I say never, I mean never,” MIT labor economist David Autor told American Public Media’s Marketplace. History is littered with technological transitions. Many of them seemed at the time to threaten mass unemployment of one type of worker or another, whether it was buggy whip makers or, more recently, travel agents. But here’s what’s different about information-processing jobs: The takeover by technology is happening much faster. From 2000 to 2007, in the years leading up to the great recession, GDP and productivity in the US grew faster than at any point since the 1960s, but job creation did not keep pace. 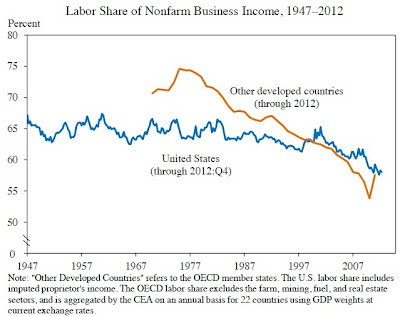 Brynjolfsson thinks he knows why: More and more people were doing work aided by software. And during the great recession, employment growth didn’t just slow. As we saw above, in both manufacturing and information processing, the economy shed jobs, even as employment in the service sector and professional fields remained flat. Especially in the past ten years, economists have seen a reversal of what they call “the great compression“—that period from the second world war through the 1970s when, in the US at least, more people were crowded into the ranks of the middle class than ever before. There are many reasons why the economy has reversed this “compression,” transforming into an “hourglass economy” with many fewer workers in the middle class and more at either the high or the low end of the income spectrum. But whatever those forces, they are clearly being exacerbated by technological change. The hourglass represents an income distribution that has been more nearly the norm for most of the history of the US. That it’s coming back should worry anyone who believes that a healthy middle class is an inevitable outcome of economic progress, a mainstay of democracy and a healthy society, or a driver of further economic development. Just back from his three-year stint on the Monetary Policy Committee of the Bank of England, the new president of the Peterson Institute for International Economics sat down with TIE founder and editor David Smick. Tara Lohan: How did this book project come about? I know it started out as a book about tar sands, but then it evolved into so much more. ...over the course of the next few years, we're going to be making absolutely critical decisions about our energy future, our environmental future and our economic future. Unless we have these basic elements of energy literacy, unless more of us understand the criteria by which to evaluate these different sources of energy, we're going to get a lot of things wrong. We think energy literacy is really important. So now [subsequent to the passing of H.R 933], Monsanto is free to develop, plant, and sell all sorts of genetically modified foods, without fear of being sued or prosecuted if they fail to abide by the federal government’s health, safety and environmental standards. But just how did this teeny tiny provision get into an appropriations bill in the first place? That’s where Missouri Republican Senator Roy Blunt comes in. According to the New York Daily News, Blunt helped to carefully craft the provision’s language with the direct help of Monsanto. Why would he do that you might ask? It could be because, according to the Center for Responsive Politics, Sen. Blunt received nearly $65,000 in campaign contributions from Monsanto between 2008 and 2012. In fact, Blunt has been the largest Republican Party recipient of funding from Monsanto in recent memory. The good news here is that this provision that protects Monsanto from judicial oversight expires after a year. The bad news is that this little provision with a big impact is just a symptom of a much larger problem in America today. Right now, any corporation with money to spend can team up with elected officials, and slowly but surely tear away at our governmental protections. You need to know this. A little-known provision in the most recent budget appropriations, which passed through Congress last week, is a big deal for biotech giant Monsanto – and GMO opponents. The so-called "Monsanto Protection Act" shields the maker of genetically modified seeds from being sued by consumers who claim they've been harmed by their products. On Tuesday, President Obama signed the spending bill into law, which means the controversial GMO provision will remain in place for at least six months until the government needs a new bill to fund it's operations. Since it's passage a week ago, more than 250,000 people have signed a petition opposing the measure, and activists have gathered outside the White House to protest. Opponents are expressing anger not only about the "Monsanto Protection Act" content, but also about the secretive way the legislation made it's way into the final appropriations bill. Reports suggest that many members of Congress were not even aware the provision was slipped into the spending bill. The International Business Times reported on the story, noting, "The message it sends is that corporations can get around consumer safety protections if they get Congress on their side. Furthermore, it sets a precedent that suggests that court challenges are a privilege, not a right." It should be a right to know what is in our food. And it should be a right to hold companies liable when they poison consumers. We must ensure that the "Monsanto Protection Act" is overturned. Call Congress and tell them to repeal this provision now. In the U.S. we learn from an early age to navigate hierarchical social structures, and we have lots of practice competing but little practice cooperating. So we have a lot to learn in order to make cooperatives a success. But many people are willing to make the effort. We have participatory instincts that are stifled in the dominant economy. One friend lit up when I told him that in worker cooperatives, people are encouraged to put forward their ideas about how to make the company better. That’s sure different, he said; everywhere I have ever worked you’re best off if you keep your head down and your mouth shut. So I wouldn’t say that workers are resistant to cooperation, but rather our cooperative instincts are suppressed and trained out of us. To help overcome this, all of the co-ops we visited place a high priority on initial training and ongoing leadership development of their members. And it works. Melanie Foley — Where Are the Country's Least Happy and Healthy Americans? New Studies Reveal America's "Sadness Belt"
Where Are the Country's Least Happy and Healthy Americans? New Studies Reveal America's "Sadness Belt"
Video and transcript of Paul Jay interviewing Michael. The idea by the Progressive Era in the early 20th century was that instead of banking being predatory as it had been for thousands of years, instead lending against real estate or to governments for war loans – or for petty consumer usury, foreclosing and putting people in debtors’ prisons – for the first time in history banks were going to make loans to finance direct investment in new means of production. The aim was to mobilize banking and savings to expand industry, to build factories and equipment that weren’t already there. This is how Germany rose rapidly to industrial power with the Reichsbank, along with the rest of central Europe. Leading up to World War I, German banks worked with the German government almost as semi public entities – along with the military-industrial complex, to be sure. But at least you had banking taking industrial form. World War I changed everything. You had a reversion to the English-Dutch-American kind of banking that was called merchant banking. Banks would make loans to ship goods that are already produced, or they’d make loans against real estate. So today you have 80 percent of bank loans in America and England and Scandinavia are all loans for real estate. So, essentially the function of the financial sector has been simply to load down the economy with debt without helping the economy grow. What you really want is for banks, instead of loading the economy down with debt, to be able to finance economic growth instead of just eating into growth as an overhead. Think deposits in US banks are "safe"? Think again. On Friday, President Obama outlined a new plan that, he said, would seek to attract private investment for public infrastructure, while also creating new bonds and offering more loans for similar projects. A think-tank in Washington has one idea for leveraging private investment toward infrastructure: encourage the investment of labour union pension funds in infrastructure projects. “Couple [our poor state of infrastructure] with pension funds, which are long-term, patient investors, with stable, risk-adjusted returns, and this fits well with our fiduciary duty,” Dan Pedrotty, managing director of benefits and pensions at the American Federation of Teachers, said Thursday at the release of a report on the topic at the Center for American Progress (CAP). Pension funds present a viable alternative to traditional public financing because their large-scale assets and long-term nature give them the ability to put up a large amount of capital and see projects through to their payoff—obstacles typically thought to be too large for any investor except the federal government. The report also suggests the time is ripe, both economically and politically, for this kind of change. This is incoherent from the point of view of monetary economics given the existing monetary system. However, there is actually a rationale to it that works. In providing infrastructure bonds, the federal government is providing safe asset and an interest subsidy for future pensioners, similar to the Social Security trust fund. While neither taxation nor borrowing are necessary operationally, they are apparently necessary politically in order to elicit the bipartisan support required to pass legislation. The difference is that the Social Security trust fund is "funded" by taxes, while the infrastructure improvements would be "funded by borrowing." Whatever it takes, I guess, given the prevailing level of asininity in policy making. But it would be simpler to just cut to the chase and use the available policy space to deploy the available resources that are not being requisitioned by the private sector. Just as the Industrial Era replaced the Agricultural Era and was different from it, so too, the Digital Era is replacing the Industrial Era and bringing about another profound transformation of work and management. This is lifted from the Modern Money Primer blog by Randall Wray and is now available as a book from Amazon. "According to the well-known trilemma,government can choose only two out of the following three: independent domestic policy (usually described as an interest rate peg), fixed exchange rate, and free capital flows. A country that floats its exchange rate can enjoy domestic policy independence and free capital flows. A country that pegs its exchange rate must choose to regulate capital flows or must abandon domestic policy independence. If a country wants to be able to use domestic policy to achieve full employment (through, for example, interest rate policy and by running budget deficits), and if this results in a current account deficit, then itmust either control capital flows or it must drop its exchange rate peg. "Floating the exchange rate thus gives more policy space. Capital controls offer an alternative method of protecting an exchange rate while pursuing domestic policy independence. "Obviously,such policies must be left up to the political process—but policy-makers should recognize accounting identities and trilemmas. Most countries will not be able to simultaneously pursue domestic full employment, a fixed exchange rate, and free capital flows. The exception is a country that maintains a sustained current account surplus—such as several Asian nations. Because they have a steady inflow of foreign currency reserves, they are able to maintain an exchange rate peg even while pursuing domestic policy independence and (if they desire) free capital flows. Have We Forgotten the Trilemma? In an article behind a paywall at the WSJ lies an interesting article - blatantly. In that article, one "David Meyer Wessel" ... a "well known economics journalist [and Economics Editor,] with The Wall Street Journal and a Pulitzer prize winner and author," adds the following, grossly errant presumptions. "Problem one: Governments from the U.S. to Egypt to Japan are running big, unsustainable budget deficits. Problem two: Global governments are finding it tough to agree on an efficient, fair way to head off climate change." So it's not just us! The whole world is, in fact, running out of fiat. Must we faithfully accept - like sycophants absorbing Creationist literature - what is quite obviously a logical fallacy? Must we accept illogic as nevertheless "true," simply because a Pulitzer Prize winning credentialist tells us it is? Who ya gonna believe. Logic, or Credentialist Emperors devoid of even a stitch of logic? How long do we wait before some kid accidentally blurts out that the Credentials have no logic? Maybe all those logical fallicists at Lake Wobegone will be the ones to call the fiat debts, once we have nothing "left" in virtual banking reserves? Weepin' Buddha on a Decline! We needn't bother even bringing in the Mad Hatter to advise on policy. The words used in policy pronouncements don't even have to mean precisely what lobbyists want them to mean. Why, they needn't represent any coherent meaning whatsoever! The immediate "Problem One" here is that the Economics Editor of the WSJ seems to know exactly squat about the most basic fiat currency operations and banking operations. This is amazing. You know your country is screwed when the most exalted experts fall into the lunacy of spewing data rendered meaningless by total lack of context. "The summary sentence, of course, should be, 'from New York to Cairo to Japan, governments are enabling their private sectors to save more with safe net financial assets, after a long period of over-leveraging.' Somehow my [1st year econ] students can understand that. Why can't journalists?" Indeed, Brad. Indeed. And why not economics editors too? We may as well all get busy asking repeatedly. More informed journalists are apparently gonna' be a long time coming, so we need a growing chorus of people either asking those questions, or voting with their feet, and interacting proportionally more with the people in this world who already can and do understand basic fiat currency operations. Timothy Taylor — Is "Intellectual Property" a Misnomer? If "intellectual property" is not a misnomer, then it needs to be explained on what basis a property right is time-delimited, as are copyrights and patents but not other forms of property. Is this a property right or a subsidy granted by law, e.g., to foster innovation and creativity? Between directly lowered prices, tax breaks, and the failure to properly price carbon, the world subsidized fossil fuel use by over $1.9 trillion in 2011 — or eight percent of global government revenues — according to a study released this week by the International Monetary Fund. The biggest offender was by far the United States, clocking in at $502 billion. China came in second at $279 billion, and Russia was third at $116 billion. In fact, the problem is so significant in the U.S. that the IMF figures correcting it will require new fees, levies, or taxes totaling over $500 billion a year, or more than 3 percent of the economy. As Warren Mosler says, a subsidy is a negative tax. Now we learn that it is necessary not only to eliminate the subsidies but to increase taxes and regulation (which increases costs) in order to save the home planet. But developing an inexpensive, renewable, clean source of transportable energy is of the highest priority to avoid severe culling of the species. Les Leopold — Why Is Socialism Doing So Darn Well in Deep-Red North Dakota? But North Dakota is also red in another sense: it fully supports its state-owned Bank of North Dakota (BND), a socialist relic that exists nowhere else in America. Why is financial socialism still alive in North Dakota? Why haven't the North Dakotan free-market crusaders slain it dead? Why Is Socialism Doing So Darn Well in Deep-Red North Dakota? Good article in general, but with a few lapses, like "Banks are supposed to serve as intermediaries that turn our savings and checking deposits into productive loans to businesses and consumers." It also promotes the Public Bank Institute at the end, and the folks at PBI don't still don't get monetary economics even though it has been explained to them in detail. Some readers have encouraged me to provide an MMT perspective on Cyprus. First a caveat: I have no special expertise on that country. However, as all of you know, MMTers have been warning about the fate of Euroland for almost two decades. As you watch one after another of those dominoes fall, you cannot help thinking about theWild Africa documentaries you watched on TV when you were a kid. Remember when the pair of lions sneak up on a herd of wildebeest? The lions pounce on the weakest one. The others are startled, watch the lions munching on their brother for a minute or two, and then go right back to grazing. “Better him than me”, they appear to think. And so goes Iceland, Ireland, Spain, Portugal, Italy, Greece and Cyprus. The Dutch and French and Germans just keep grazing that grass. Ok so what went wrong in Cyprus. Lord Keynes — Warren Mosler to debate Robert Murphy? What little details available are here. This sounds very interesting, but Murphy seems a rather strange choice as a champion of Austrian economics. Why? The reason is that Murphy is something of a maverick who thinks that the interest rate is a monetary phenomenon, both in his PhD Unanticipated Intertemporal Change in Theories of Interest (2003) and in this [link] post. That is, he rejects the widespread Austrian theory of interest: pure time preference theory. More seriously, in this interesting paper and in this post, Murphy admits that Sraffa demonstrated that outside of equilibrium there is no single Wicksellian natural rate of interest, and that Hayek never really addressed this problem for his trade cycle theory. Follow on to this post which was cited at MNE here. Clear description of how reserves function in the payments system. I hope Robert Murphy reads these posts before the debate with Warren. What is amusing is that using fixed exchange rate thinking with floating rate currency areas is still the problem today. Clearly something is amiss in the land of opportunity. Michael Stevens — How Much Fiscal Stimulus Do We Need? How much fiscal stimulus would the government need to inject into the economy over the next two years in order to get the unemployment rate into the 5.5–5.9 percent range? In their newest strategic analysis, Dimitri Papadimitriou, Greg Hannsgen, and Michalis Nikiforos provide us with some harrowing answers. How Much Fiscal Stimulus Do We Need? Gail Collins has a terrific piece in how the GOP used to be concerned about the environment, but now, not so much. You may be wondering who the objecting senator was. Normally, these things are supposed to be kind of confidential, but in this case the lawmaker in question is proud to let you know that he is — yes! — Ted Cruz of Texas. “A provision expressing the Senate’s views on such a controversial topic as ‘climate change’ has no place in a supposedly noncontroversial resolution requiring consent of all 100 U.S. senators,” a Cruz spokesman said. Note that the offending statement doesn’t even spell out what caused these “changes in climate.” It merely states that when such changes occur, women in developing countries are disproportionately affected. Kind of a “duh” statement. But not for the Senator from drought-stricken Texas. Advocates for a balanced budget amendment to the U.S. Constitution have pinned their hopes on state legislatures calling for a new constitutional convention to get the amendment included. The Balanced Budget Amendment Task Force, a Virginia-based group, has been pushing for states to use Article V of the Constitution, which allows Congress to call for a convention if petitioned by two-thirds of the states, or 34 states.Currently, 17 states have submitted petitions calling for a convention in order to add a balanced budget amendment. "Our founders really, truly believed -- and if you read Hamilton and Madison in the Federalist Papers the intent was clear -- that if the central government went beyond its bounds, the states have the way to close the divide peacefully," David Biddulph, the co-founder of the Balanced Budget Amendment Task Force, told The Huffington Post. An Article V convention has never been called, even though 49 states have submitted at least one petition calling for such a convention. Currently, at least three states are considering petitions: Georgia for the balanced budget amendment, Indiana to balance the power between the states and the federal government, and Kansas to move certain powers solely to the states. I guess these folks want to cede the future to the BRICs. Winterspeak — Marc Andreesson: Strangely self-serving? 1. The middle class is now missing out on hot-IPO action because all the value creation is happening in private markets, and post-IPO performance is disappointing as the company is already past its prime. Therefore, we should loosen the rules barring non-accredited investors from primary markets. 2. Kickstarter, and other crowd funding projects, actually expose these individuals to seed stage investments that are the most risky. 3. We need to roll-back decimalization, so there is a larger spread in trading small cap stocks, making it easier for financial firms to profit from their trading. My interview with Jonathan R. Macey from Yale Law School. His new book, "The Death of Corporate Reputation. How Integrity Has Been Destroyed on Wall Street". ...my conclusion is that I should stop calling the current episode the Lesser Depression. Yes, its shape is different from that of the Great Depression; but, so far at least, there is no reason to rank it any lower in the hierarchy of macroeconomic disasters. Since then many people, including the writers of this blog, have been watching events intensely. It is common among these critical observers to think (and to have thought) that the semblance of stability that was brought about by early 2009 couldn’t be sustained, either domestically or internationally. I think this reasoning is correct. However that thought in and of itself doesn’t tell us when things will fall apart. Governments have a huge amount of power to keep the game moving, but they are constrained by the availability of real resources, like energy, and the actions of other governments, which in extremis, lead to war. The game began to get unsustainable back in the 70's with the end of the era of guaranteed cheap oil. Petroleum remains the principal energy source of modern economies, and there is no obvious replacement on the horizon. With climate change forcing a re-think of carbon-based energy, this is the elephant in the room. Financial crises can be fixed, but the environment is something that governments do not control. The vise is tightening. Matias looks at China somewhat differently than Pettis does. As I illustrated in a previous post, “a significant proportion of the balance sheet of wealthy Americans is made up of real assets – real estate, stock and business holdings”. Therefore “what wealthy Americans, businesses and banks share is a common interest in supporting asset prices (real and nominal), a lack of interest in seeking full employment unless it is a prerequisite for supporting asset prices, and an aversion to any policies that can trigger wage inflation”. The fact that our dominant macroeconomic policy doctrine depends upon the ‘wealth effect’ simply reflects the fact that our economy is driven by wealthy special interests. The real question again is why there isn’t more mass opposition to such a blatantly regressive policy regime. In previous posts(1, 2), I have argued that crony capitalism achieves broad-based support by piggybacking upon broad-based programs aimed at the middle class. But they also achieve this support due to the absence of a safety net that breeds middle-class insecurity. This carrot-and-stick approach ensures middle-class support for the same stabilising policies that transfer wealth to the one percent. Got that? Read the rest to see how it is done. The move by North Korea's leader comes after US flies two stealth bombers over South Korea in a rare show of force. The moment of truth approaches for NK as the US decides to call the bluff. Defense secretary says his country is ready to "deal with any eventuality" hours after Pentagon deployed B-2 bombers. For those following Keen/Krugman on IS-LM, here is something from Andrew Lainton. 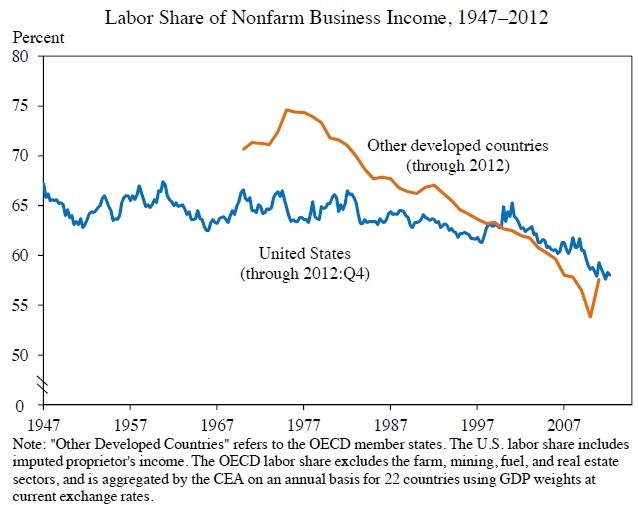 Given that the fall in labor share of income is larger in other countries than in the U.S. economy, the cause or causes should presumably be something that had a greater effect on many other countries than on the U.S. economy. Any narrowly U.S.-centered explanations are bound to fall short in explaining an international phenomenon. All taylored to enrich the fat cats. Charles Hayden has informed me that both parties have accepted the invitation to debate, since it appears that Paul Krugman has decided not to accept Robert Murphy's challenge. Details to be announced when the venue is settled. Stay tuned. It's on. Is There Any Culture Left, Anywhere, That is Agile Enough to Prevent It's Own Failure? Not in Cyprus, not in the eurozone, and not here in the USA? What could we possibly do differently? Everything? So why aren't we actually doing just that? 630 million right & left hands no longer know what one another need, let alone what 315 million people collectively need? Not to mention one, supposedly organized nation. Forget greater than. Are we actively making ourselves less than the sum of our parts? We can't succeed trying to calculate everything individually. That's ridiculous, and mathematically impossible. Every organized system constantly employs uncountable numbers of credits and risky debits. We survive ONLY by ruthlessly prioritizing the top few gains, and continously writing off all the negligible & irrelevant debts. The worst idiocy is to forgo unimaginable return-on-coordination, in order to chase irrelevant, static, supposed debts to self. For those of us with small, calculating minds, what part of "most data is irrelevant" don't you get? Cultural OCD may be the death of our nation yet, if we don't keep it away from group policy channels. They won't make a sound no matter how many of them you try to toss in a bucket, and you can't pitch them in a fountain and wish for good luck. But make no mistake, bitcoins are getting big. Is Bitcoin a "safe asset"? Matt Franko has been beating on this point for some time here. There is sure to be some quibbling in the (shrinking) Big Tent over this issue — as Paul Ryan already found out. Interesting headline. Talk about prejudicing the case. The first meeting is a "failure" when the parties agree in principle but details need to be hammered out, like where the institution will be based and what the contributions to capital will be? The institution doesn't even have a name yet. Picking a Banking Derby winner. Whose "horse" .. er .. Senator Are You Backing? Or are all 4 candidates just show horses for the same owner? Say, who DOES own Congress, or at least command their allegiance? The guessing game has already begun over the successor to Sen. Tim Johnson as chairman of the Banking Committee. Hmmm. Is there an app to summarize which lobbies have the swing vote for each guy's campaign funding? Who "owns" each of these guys? Contrary to popular opinion, the de facto owner in each of these 4 cases is NOT the constituents who supposedly voted them into office. Disorganized voters are easily conditioned - by cartoons and glossy ads appealing to their base instincts - to pick a horse from the real owner's stable. I repeat. Is there an app to summarize which lobbies have the swing vote for each guy's campaign funding? Come to think of it. Is there an app to just help voters act like an owner? So they can actually own the politicians whom they currently own in name only? Many Democracy failures arise out of a basic ignorance regarding political operations. Ditto for lost freedoms. Politics, thy name is fraud. We need apps to cut through the Fog of Fraud, and then voters both savvy enough and active enough to use such apps. Those individuals - and countries - with a bias to coordinated action typically can or do own the majority of static assets - whenever they want to. That observation demonstrates yet again the superiority of dynamic value over static value. Army ants (and many other, mobile critters) eat snails at will, even though snails have an impressive housing stock [and mortgages? :) ], which army ants don't bother with (most of the time). What's the similar class relationship between snails/Senators and army-ants/electorates? The former class covets the staid safety of static assets, such as the trappings of power. The latter class - when active and organized - utilizes the former do what's needed, when and as necessary. If not, well, a group mind is a terrible thing to waste. Ethics is the basis of social and political thought (or "philosophy") and social and political thought are rigorously expressed in testable fashion in sociology and political science. Social systems are normative since people exhibit values and disagree over values. This is a cognitive (subjective) condition that has behavioral expression. Subjects act at least in part using values as norms and these norms functions as motivators and shapers of action. One aspect is the nature and function of norms in regulating behavior individually and socially, and another is the consequences of following different sets of norms. These two aspects engender many issues that have been debated for millennia. In addition to consequentialist ethics there is another type of ethics called deontological ethics that asserts that certain norms are given as fundamental values, such as duty, or as God's will expressed in codes of conduct as divinely ordained instructions. This is also a consequentialist ethics of a sort also to the degree that supernatural reward and punishment are involved. Thus virtually all norms involve the form, if you do such and such, then the consequences will be so and so. From this it follows that if you want so and so, do such and such, and if you don't want so and so, don't do such and such. Broadly speaking, this is the basis of an approach to ethics that presumes people act rationally and take consequences into account as the chief motivator of action. How this in fact works cognitively and behaviorally is a matter of scientific enquiry, and how it should work is matter of ethical (philosophic) enquiry. Economics either presumes an approach such as utilitarianism, as does neoclassical economics with utility maximization,derived from Jeremy Bentham and John Stuart Mill, or constructs an approach on philosophical grounds, as did Ludwig von Mises in Human Action. Keynes took a more romantic in addition to rational approach in positing the important of "animal spirits," that is the role of emotion, in determining behavior, and acknowledging the role of uncertainty in decision making. "Romantic" is a technical term here, meaning feeling as opposed to reason. Reason is the cognitive influence on volition and feeling is the affective influence. Rationalists hold that reason is the chief factor in motivation, and romantics that feeling is the chief motivator. Most hold that some combination of the two is operative and in different proportions in different personality types. But extreme rationalists hold that reason is completely dominant, and extreme romantics hold that feeling is completely completely dominant. Abraham Maslow launched a more rigorous psychological approach that was not as rigid as Skinner's behaviorism, bringing in a range of motivators and their ordering in a "hierarchy of needs." Cognitive and behavioral economics are now investigating motivation using the methods of their fields. Cognitive and behavioral studies suggest that Keynes was on the right track with "animal spirits," but that he did not go far enough. These endeavors seek be rigorous in the scientific sense. On the other hand, political economy is based on the application of values and norms to policy formulation. Here, specifically ethic (philosophic) issues arise that are related to ideology instead of science, that is, to "ought" and "should" instead of "is." Then the question become one of criteria and their justification. The fundamental question is whether there are universal criteria that provide an absolute standard for moral judgment morally. As Lord Keynes says, "Ethics is never far from the surface of discussions of economics, especially practical economic polices." Lackluster Consumer Confidence report for March out today from the Conference Board. Story at MarketWatch here. The consumer confidence index slumped to a reading of 59.7 in March from 68.0 in February. That’s well below the 66.5 expected in a MarketWatch-compiled consensus. February’s reading also was downwardly revised from an initial 69.7 report. Most of the drop came from a decline in the expectations index, which slumped to 60.9 from 72.4, though the present situation index also fell, to 57.9 from 61.4. The index was the second large drop in three months. That said, retail sales growth has been solid the first two months of the year, posting monthly gains of 0.2% in January and 1.1% in February. We can examine these confidence readings over the recent past months that are discussed in the article in light of the fiscal data over this same time period in the table below. We can see that the extremely large Net Withdrawals from the TGA in February align perfectly with the anomalous higher confidence readings in this same month. And a precipitous drop-off in December followed up by a generally lackluster January align well with the lower confidence numbers in those months also. Just a small window of time presented here granted, but this data seems to suggest that confidence increases as the government sector injects higher amounts of $NFA into the non-government so that we can make payments on our liabilities and perhaps even save a little ... hmmmmmm, who would have thought? Earlier this month the Athens Development and Governance Institute and the Levy Economics Institute held a forum on the eurozone crisis: “Exiting the Crisis: The Challenge of an Alternative Policy Roadmap.” Below are the remarks [on video] delivered by senior scholars Jan Kregel and James Galbraith. There is an important distinction between good deflation caused by excess supply and bad deflation created by deficient demand. Good deflation is the result of new technologies that power productivity and output as the economy grows rapidly and as supply outpaces demand. The bad kind stems from financial crises and deep recessions, which increase unemployment and depress demand below the level of supply. Gary Schilling has made accurate forecasts in the past, but his understanding of monetary economics is primitive. His point on good and back deflation is well taken, though. The most significant way to achieve good deflation going forward is to develop low cost alternative energy sources whose actual cost is not obscured by unacknowledged externalities. The cost associated with carbon-based energy is turning out to be exorbitant and the non-financial consequences unsustainable. This is a no-brainer that needs to be on the front burner. Instead, Schilling wastes ink on "excess reserves." This weekend, the Wall Street Journal assembled a redoubtable list of conservative heavies in economics (George Schulz! Gary Becker! John Taylor!) to produce a completely insane account of what is wrong with America's economy and how to fix it. The upshot of the piece is that the U.S. economy is in the tank because the government gives too much money to poor people, and so it should stop.￼What's most amazing about this piece is what's not in it: any acknowledgement of the specific circumstances that led to the downturn of 2008 and the slow recovery from it. There's no discussion of the housing bubble and the financial crisis, of weak consumer demand as households struggle to deleverage, or of the vast number of job seekers for each available job. Instead, the authors identify the country's pressing problems as "excessive spending and taxes, growing debt, interventionist monetary policy, and burdensome regulations that have slowed economic growth and job creation." Some of these conditions have indeed arisen from the 2008 crash: Recessions cause government spending and debt to rise relative to the economy. But the authors have the causation wrong: Slow growth has led to rising spending and debt, not the other way around. For 'Faster Growth,' Soak the Poor? Laura — They want an aristocracy and won't quit until we all be serfs, plain and simple. lemnyc — There is a very simple name for the approach favored by Schultz, Becker and Taylor: Class Warfare. Looks like a pitch for "your chance to get in on the ground floor" type of thing... this is BY NO MEANS an endorsement. Provided FYI for academic purposes only. Continuously Re-Building a "National Map of Vulnerable Processes"
Is This possible? Start Continuously Re-Building a "National Map of Vulnerable Processes"
You better hope so. That's all that's kept us alive this long. Wonkish but important in taking down the foundations on which the neoclassical assumption of equilibrium based, positing a representational rational agent using utility maximization as the driver. The problem lies in defining "utility" in a way that provides a connection between the theory and the world it purports to explain through a general description. The problem with "utility" is that it is subjective, hence, non-descriptive. Samuelson tried to overcome this bias using revealed preference, which is behavioral, hence, can be described, e.g., through indifference curves. The post is why this approach is also deficient. Neoclassical economics presumes a downward sloping demand curve, and this cannot be shown convincingly using revealed preference as Paul Samuelson had attempted. It goes without saying that Western elites - even mired in stagnation and bankruptcy - won't let any of their privileges go without a fierce fight. Not perfect, but this really helps Jane/Joe Sixpack understand banking. Nicely worded. Here's an avowed "gold bug" who actually understands banking operations post 1933. There's nothing incompatible with understanding fiat currency and investing in gold or other static assets. The two asset classes are NOT incompatible. Rather, they're inseparable. One's a static asset, the other's the dynamic unit of account that allows unlimited, on-demand liquidity between all asset classes. Can't have an agile, functioning system without both. The issue is not whether we should have both. That faux argument just distracts us from the real issue of adequately regulating the crooks that creep into every avenue of human activity, especially banking. Came across two interesting posts in surfing the blogs (hat tip "everybody"). One is at NEP by Mitch Green on the Economic Surplus here. Through the ages we have erected monuments in honor of our ability to generate an economic surplus. That we perennially produce more than we consume, which of course varies in degree and kind depending on the age and place, means that we simply do not live in a world of scarcity. The materials we use to shelter and feed ourselves, and even pay homage to our cultural heritage are themselves the product of human labor and ingenuity. That is to say, how we get our daily bread depends not so much upon gifts from Mother Nature, but in our ability to coordinate social labor. Homo sapiens is a clever species. I think Mitch is on to something very important wrt pointing out "the surplus", and our current mis-management of the distribution of it. But would add that yes although some human input is required, from a secular/pagan perspective, "Mother Nature" is involved to a greater extent than humans are in the deliverance of the current surplus. For feedstocks from which we indeed obtain 'our daily bread', we may plant the seeds and perhaps water them a bit, but who among us can take it from there? This writing is a bit vain in this regard especially when we are trying to make the case that our species is "clever" when at the same time our current crop of "leaders", our "elites" so-called, are all running around saying "We're out of money!" and that we are "Borrowing from the future!". Spare me the accolades for the human at this particular moment, but Mitch's eyeballs are indeed focused on what should be getting much more attention, our great surpluses in real terms. Another interesting link via Matias V. here to a recent paper of a Fair Model of the U.S. macro system, that includes some interesting perspectives on macro modeling generally. A macroeconometric model like the US model is a set of equations designed to explain the economy or some part of the economy. There are two types of equations: stochastic, or behavioral, and identities. Stochastic equations are estimated from the historical data. Identities are equations that hold by deﬁnition; they are always true. There are two types of variables in macroeconometric models: endogenous and exogenous. Endogenous variables are explained by the equations, either the stochastic equations or the identities. Exogenous variables are not explained within the model. They are taken as given from the point of view of the model. For example, suppose you are trying to explain consumption of individuals in the United States. Consumption would be an endogenous variable-a variable you are trying to explain. One possible exogenous variable is the income tax rate. The income tax rate is set by the government, and if you are not interested in explaining government behavior, you would take the tax rate as exogenous. Goes on from there and includes both government Monetary and Fiscal Policy inputs. Looks very interesting. To me, these two posts are related in that our economy should be "modeled" to deliver what we collectively determine via the authority of our government institutions, a (at least minimally) just and guaranteed distribution of the "surplus". A "surplus" that, to stay in the pagan vernacular, is ultimately provided by "Mother Nature", not the human.